Twin Cities Wine Education is proud to present a special night of fabulous rare wines! 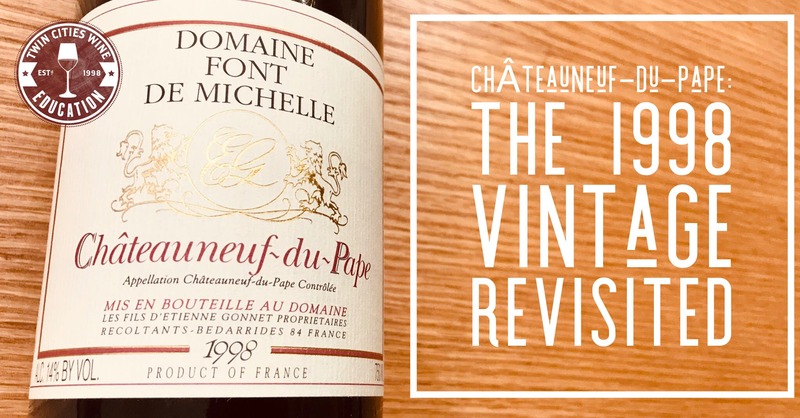 In the late 1980s and early 1990s, the Rhône Valley was still relatively unknown to Americans, who were focused on the regions of Bordeaux and Burgundy for French wine pleasure. Then came Robert Parker and his publication The Wine Advocate, who championed the wines of the Southern Rhône as some of the great bargains of the wine world. His love of the Rhône also helped elevate the best sub-region within it: Châteauneuf-du-Pape. As popularity went up, so did the prices. But one vintage, in particular, propelled Chateauneuf-du-Pape forward in the wine world, and that was 1998. Join us for a special evening learning about Chateauneuf-du-Pape, the key producers, and the influence of age on these gems.